Social networking websites are one aspect of the Web that continues to enjoy explosive growth, at least in part because users love to share information. While major social media sites like Facebook, Pinterest, Twitter and Instagram tend to define social media, there is a growing niche market including one for the Christian demographic. If you're interested in 'joining the conversation' specific to this niche, there are a number of Christian-specific social media sites you may want to consider. 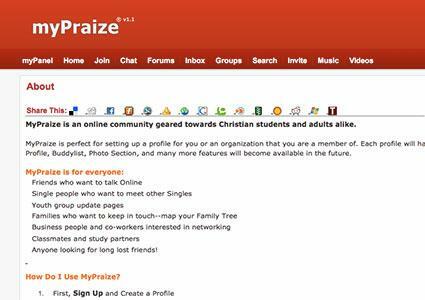 Intended to appeal to both young people and adults, MyPraize refers itself as "the Internet's first Christian social network" on the site's Facebook page. The site leans heavily on the Christian music industry and for its content and hosts more than 200,000 Christian music videos. It primarily appeals to the music-oriented, but that is not to say others would not find the online community engaging. The sites includes forums, chat rooms and even blogs to build its online community. The site's main weakness is its bare bones design, which, according to their Facebook page as of June 2014, it is being redesigned and reprogrammed. Launched in 2005 as an alternative to MySpace, this site has done a nice job of giving Christians an alternative place to go to get the same sort of community. However, since being acquired by Left Behind Games in 2011, little has been done to modernize the site so how much value the company sees in the network remains to be seen. Sign up is free, not restricted by age and you can join either as an individual or as a band. Bands can designate their music genre. Individuals are asked, but not required, to give their date of birth (which can be hidden if given). Other required information includes: username, name, email address, password, country and whether or not you are a youth minister. 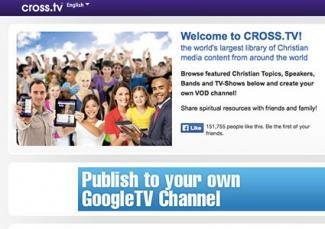 If you enjoy videos across a wide spectrum of Christian themes, check out Cross.tv. This social network has "the world's largest library of Christian media content from around the world." The neatly-organized and easy-to-navigate site has four categories of Christian-specific content on its landing page: topics, speakers, bands and TV shows. This is one of the more robust Christian-themed social media sites, both in content and membership. Besides having several online communities, the site's content is supplemented with blogs and videos - updated regularly - keeping the site's content fresh. The site is definitely designed for -and trying to appeal to - a worldwide audience as the site can be viewed in more than one dozen languages. One of the downsides of the site is the lack of an easy-to-find About page, which would let the casual user get a better understanding of the site's purpose and perks with being forced to join. But you can learn more about the site on their FAQ page. It has more than 600,000 members representing more than 22, 000 churches and 17,000 plus ministries. It has more than two million page views monthly. Users of all ages may join. Sign up is free and fast. Use either your Facebook account or enter your email address. Once you click the activation link, choose the type of account you want to open: individual, family/group, church, artist/band, organization/ministry. SocialCross.org is a facebook alternative for Christians that was established by a group of pastors as a way for Christians to voice their beliefs without worry over being suspended or belittled. The pastors who formed the social network had previously been suspended from Facebook for voicing their opinions on certain issues. Within three weeks of its launch, over 2,300 users signed up for SocialCross.org. SocialCross.org works similarly to Facebook. You'll need to have a valid email address to sign up and create username and password. The site is free to use and also has a mobile app. Users must agree to abide by the code of conduct listed on the site. As far as format, Faith Book is the one that seems to most closely resemble Facebook, even though the styling is sparse. The site has a wall where user comments flow and you select which friends to share your wall with. The site is associated with Fellowship of World Christians (FOWC), an organization committed to training individuals for the ministry. Users can upload videos, send messages and interact virtually with online members. The site hosts chat rooms and forums to further strengthen its online community. It deviates slightly from the social networking format by including blogs on the site - but this seems to be a common approach for Christian-based social networking sites. 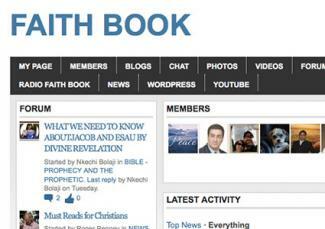 Faith Book has about 18,000 members. Sign up is free, not restricted by age and you can join with your email or by using your Google, Yahoo or Facebook account. Registration requires email, date of birth, password, and CAPTCHA characters. Compared to well-known social media sites, these sites are small, but considering they are niche sites, that is to be expected. However, despite limited membership (when compared to Facebook), these sites have an abundance of content, news and information that is of interest and importance to their members. A few of the sites are even more specialized - like GodTube - a YouTube alternative with high-quality Christian-themed videos -- and their appeal is growing. GodTube pulls in more than 3.5 million page views monthly while Crosswalk generates more than seven million page views each month.